Ratko Mladic, 'Butcher Of Bosnia', Guilty Of Genocide, Crimes Against Humanity : Parallels The International Criminal Tribunal for the former Yugoslavia found the former Bosnian Serb general guilty of multiple counts of crimes against humanity and one count of genocide. People celebrate as they watch a live TV broadcast on Wednesday in Srebrenica, when U.N. judges announce the life sentence in the trial of former Bosnian Serb commander Ratko Mladic, accused of genocide and war crimes in the brutal Balkans conflicts over two decades ago. After a 5 1/2-year trial, the former Bosnian Serb military commander blamed for orchestrating the murders of thousands of ethnic Muslims has learned his own fate. 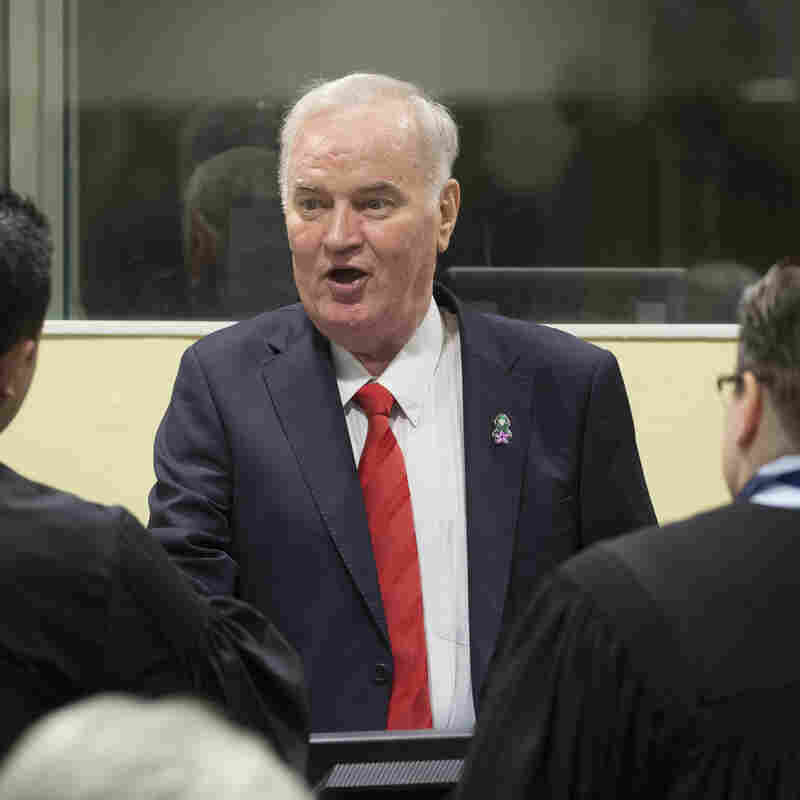 On Wednesday morning, judges at the International Criminal Tribunal for the former Yugoslavia in The Hague handed down a guilty verdict for one count of genocide, five counts of crimes against humanity and four counts of violations of the laws or customs of war, out of the 11 counts against 74-year-old Ratko Mladic, for his role as a general in the Yugoslav army and chief of staff of the Army of Republika Srpska, the ethnically Serb entity in Bosnia. The three-judge panel found him not guilty on one of the two counts of genocide and sentenced him to life imprisonment. Minutes before the verdict was to be read, Mladic, 74, shouted, "This is all lies, you are all liars," and was removed from the courtroom. Mladic will appeal, his lawyer told reporters from Reuters and the Associated Press. In a summary of the verdict, Judge Alphons Orie said the crimes "rank among the most heinous known to humankind, and include genocide and extermination as a crime against humanity." Those who suffered in Mladic's military campaign to ethnically cleanse Bosnia of Muslims and Croats during the country's civil war from 1992 to 1995 had said they wouldn't be satisfied with anything less than a life sentence for the man dubbed the "Butcher of Bosnia." Former Bosnian military chief Ratko Mladic was sentenced to life imprisonment on Wednesday for genocide and crimes against humanity. One of Mladic's defense attorneys, Dragan Ivetic, had tried to postpone the appearance, warning the stress might kill his client. 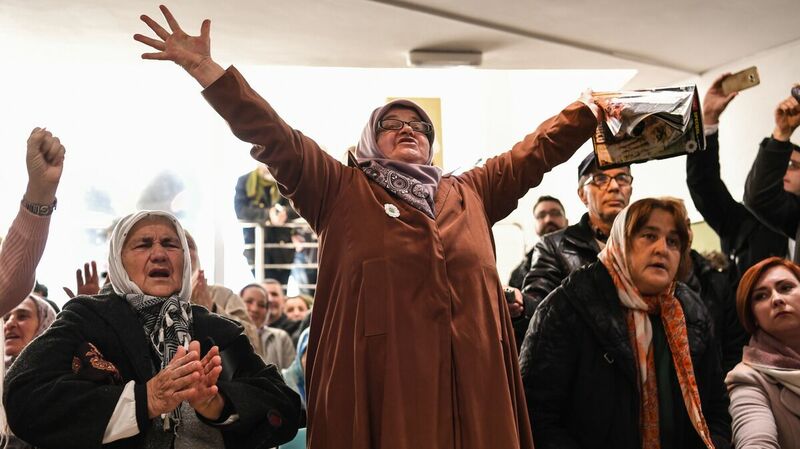 But chief prosecutor Serge Brammertz refused, saying survivors and victims, many of whom traveled to The Hague for the event, deserved to hear the judges' decision. After being indicted in 1995, Mladic went on the run, evading the long arm of the Hague tribunal until 2011, when he was discovered by Serb special forces hiding in a house owned by one of his relatives in a village in northern Serbia. He'd been living under an assumed name for 16 years. But pressure from the European Union on Belgrade over its desire to join the bloc had heightened the government's ambition to find him. Inside The Hague tribunal that Mladic called "satanic" and refused to recognize, the former general came face to face with some of the very people he'd tried to wipe out in his effort to rid the country of non-Serbs. The first witness against Mladic, Elvedin Pasic, was 14 when Bosnian Serb forces took over his village of Grabovica in 1992. Pasic said they burned down homes with people inside them. They shot his dog and stole all his family's belongings. After being rounded up, Pasic huddled with his mother in a school gymnasium, but his father and all the other village men were hauled off in buses, never to be seen again. "There is no doubt in my mind they all died," Pasic told the court through tears in 2012. Julian Borger, the world affairs editor at The Guardian and author of the 2016 book The Butcher's Trail: How the Search for Balkan War Criminals Became the World's Most Successful Manhunt, says Mladic stands out from all those designated as major perpetrators of Bosnian bloodshed. "Mladic really did the dirty work," Borger said. "He went and supervised the killings. He was on the ground in Srebrenica and he was on the ground looking down into Sarajevo, pouring in mortar and sniper fire. If there was one actual butcher with blood splattered on his apron, it was very much Ratko Mladic." Borger calls the siege of Sarajevo, which lasted 3 1/2 years, a "long, drawn-out massacre" during which Mladic was caught on intercepts urging even more attacks. But the murder of more than 7,000 Bosnian Muslim men and boys at Srebrenica is what Madlic will be remembered for, Borger says. Videos were brought into evidence of Mladic swaggering through the town after his forces took it over in 1995. "He appeared on video patting Muslim boys from Srebrenica on the head and assuring their mothers and the wives of the men that they would all be well-treated and that they would be safe," Borger says. "A couple of days later, they were massacred." U.S. attorney Christopher "Kip" Hale worked for the judges assigned to the Srebrenica case at The Hague tribunal. "The word that comes to mind is 'calculated,' " he says of Mladic. "It was not hectic or disorganized commission of crimes, but a systematic effort to divide the Muslim men from the women and children, and kill the men while deporting the rest. Nothing Muslim was left in relatively short order ... it was all about wiping them out." The scope of this crime, he believes, outweighs the other atrocities committed in Bosnia. "More death, more torture," Hale says. "Srebrenica was a businesslike atrocity to settle an ethnic score, plain and simple." Mladic's trial is the last the 24-year-old tribunal will hold. It closes its doors for good on Dec. 31, having arrested and tried all 161 of those indicted, including former Serbian leader Slobodon Milosevic, who died in 2006 while still on trial, and Bosnian Serb leader Radovan Karodzic, who was convicted of genocide last year. The court served a noble aim and did it well, Hale says. "No one argues that international criminal justice is some sort of panacea for all the ills of a country coming out of mass atrocities; no one argues that if you hold trials, everything else will be fine," he says. "However, the weight of empirical evidence demonstrates that justice is one of the most vital components to achieving durable peace. It will not fix all your problems, but without it, a country's chance of achieving lasting peace is far less likely."